Antojitos means “little cravings”. It is typically sold as Mexican street food to be eaten at other than a main meal. If you serve Mini Antojitos as an appetizer, be prepared for them to literally fly off the plate. What’s even better – they can be made ahead of time, frozen, and reheated. 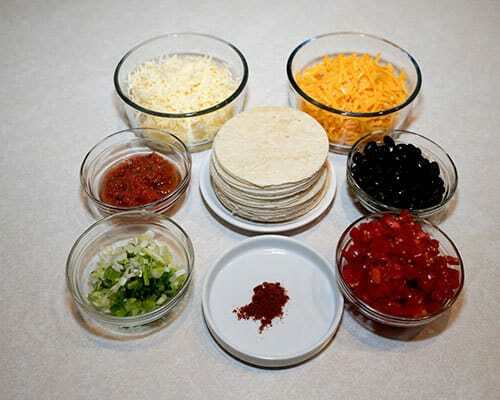 I used the following ingredients: Flour tortillas, Cheddar cheese, Monterey Jack cheese, diced tomatoes, black beans, salsa, green onions, and chili powder. In addition, I used the Cinco de Mayo Salsa that I made yesterday. It was perfect! However, any good salsa would work. I found that the most time-consuming part of making this appetizer was cutting the 3½-inch rounds of the flour tortillas. 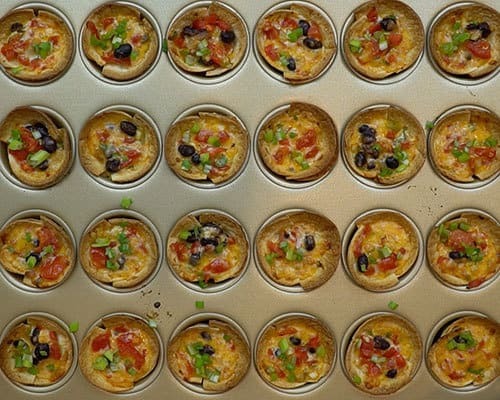 In the past, I just stuffed the tortilla rounds into the wells of my mini muffin pan. However, this time, the Master Taste Tester suggested that I cut gussets. 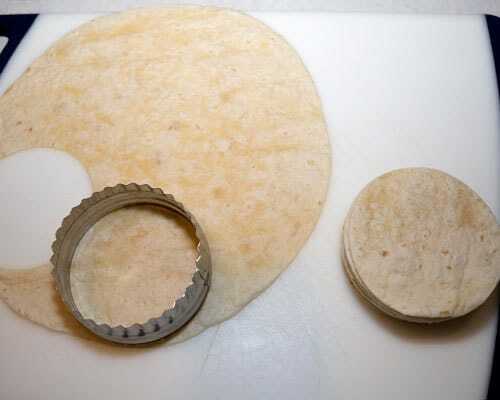 Gussets are triangles cut on opposite sides of the rounds to facilitate the molding of the tortilla rounds. OMG, it worked like a charm. 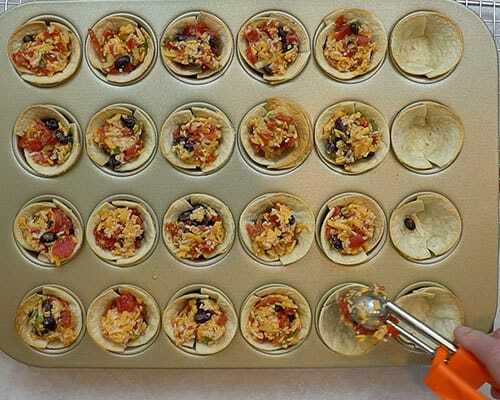 Once I had prepared the gusseted tortilla rounds, I placed them in the wells of the mini muffin pan. I made sure to press the seams to minimize any seepage of the melting cheese. I pre-baked them at 425° F for 6 minutes to help set the tortilla cups. While the shells were in the oven, I made the filling. I combined the shredded Cheddar cheese, shredded Monterey Jack cheese, diced tomatoes, black beans, salsa, diced green onions, and chili powder. Then, I added the filling to each of the tortilla shells with an ice cream scoop.. I popped the Mini Antojitos into a preheated 425º F oven for 6 minutes. After 6 minutes, the cheeses were melted and the shells, golden brown. I finished the Mini Antojitos off with a garnish of finely chopped green onion tops. OMG, talk about good! The filling was a perfect combination of cheese and other ingredients, and the shells perfectly browned. 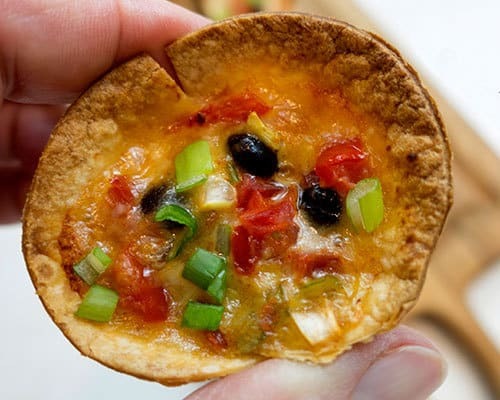 This is a perfect appetizer for Cinco de Mayo, or any other occasion calling for a simple but delectable little morsel. Yum! 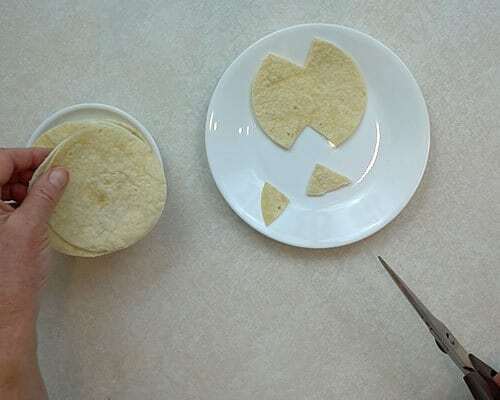 Cut each tortilla into 4 to 5 3½-inch circles. Cut 1-inch triangles on opposite sides of circles. 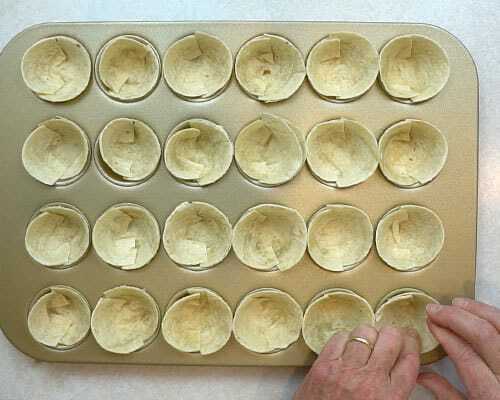 Insert pieces into mini muffin wells, pressing seams to close. Bake for 6 minutes. 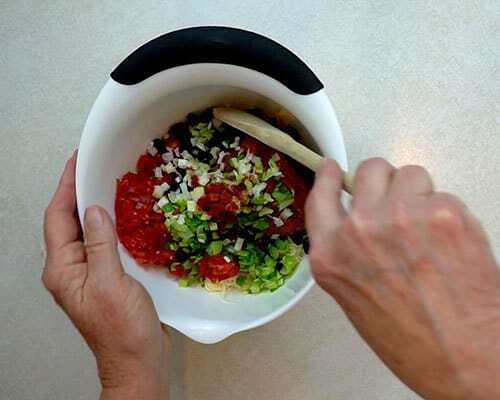 Meanwhile, combine Cheddar cheese, Monterey Jack cheese, diced tomatoes, black beans, salsa, chopped green onions, and chili powder in bowl. 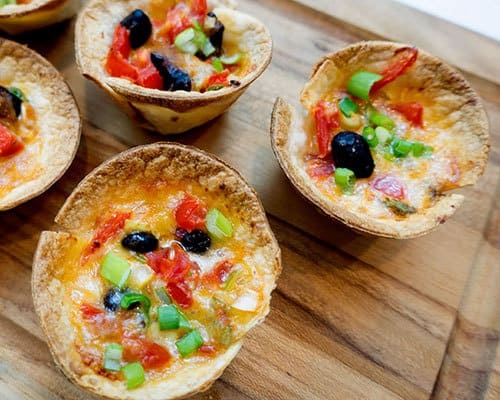 Using small ice cream scoop or teaspoon, fill each tortilla cup with filling. Bake at 425°F for 6 minutes, or until cheese is bubbly and cups are lightly browned. Remove from oven; cool on wire racks. Yield 24 appetizers.